"What difference do you think you can make, one man in all this madness?" I suppose I can understand why over one quarter of the audience watching The Thin Red Line with me in January of 1999 walked out before the film had finished. Some movies rub people the wrong way, and most often one man's masterpiece is another man's garbage. I fall into the former category. 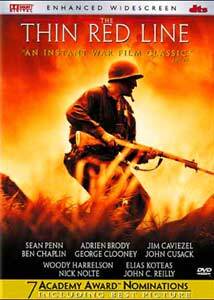 Trithfully, the worst thing about The Thin Red Line was its release date. Premiering less than six months after Spielberg's World War II film, Saving Private Ryan, the film suffered from many unjust comparisons. In actuality the films could not be further opposite from each other. The Thin Red Line is the thinking person's Saving Private Ryan; a film that focuses more on the fear of death than the war that causes it. It is a film about Man's war with himself, as well as what war does to nature. The first art film about the Second World War. The Thin Red Line shows the battle for Guadalcanal against the Japanese from the points of view of several American soldiers. At the start of the film, Lt. Col. Gordon Tall (Nolte) is given a simple order: clear a path for an airfield so that the Allied forces can overtake the rest of the Pacific. Believing Tall's order will send scores of men to their wasteful deaths attacking a seemingly-impregnable position, Captain James Staros (Koteas), refuses that order. Then there is the story of Sgt. Edward Welsh (Penn), who has a history of being uncaring, but slowly befriends Private Witt (Caviezel). And finally there is Private Bell (Chaplin) who fights his fears of death with memories of his perfect marriage. When director Terence Malick returned to filmmaking nearly two decades after making two American masterpieces, every actor in Hollywood wanted to work with him. And in turn, that is the single problem with The Thin Red Line. So many popular actors have roles that amount to little more than cameos they seem out of place, distracting the audience and detracting from the film's message. Actors like John Travolta, George Clooney, and John Cusack seem glaringly out of place in their short amounts of screen time. So why is Malick's return to filmmaking such an event? Well, imagine if directors like Tarrantino or Paul Thomas Anderson had walked away after Pulp Fiction or Magnolia, respectively. Malick's absence has only made him better. Malick paints war with such a fine stroke that it is a wonder why he ever took any time off at all, being so gifted. The battle scenes are finely done, if not better than those in Spielberg's film. Add to that the fact that Malick is a master of visual poetry, there have been very few films that I can honestly say would be as enjoyable without any dialogue at all. The Thin Red Line is such a film. The cast, comprised of both well known and unknown faces is amazing. Sean Penn and Jim Caviezel both stand out amongst the crowd. Penn, who is becoming a favorite of mine, especially deserves recognition for his scenes near the end of the film. Ben Chaplin, Nick Nolte, and Elias Koteas each give the best performances of their careers. Image Transfer Review: This is what every DVD should look like. The Thin Red Line is presented in its original aspect ratio of 2.35:1 and was at the time of the first release the first anamorphic DVD from Fox since Alien. Black levels and detail are of amazing quality, and there are no moments of edge enhancements or artifacting. Colors are sharp and the scenes of sunlight coming through the leaves of the trees in the jungle are near perfect. But the most breathtaking aspect of the image is when the sun shines onto the tall grass. It is almost like seeing a painting on your television. This is one of, if not the best, transfer I have ever seen. Audio Transfer Review: Almost as great, if not better than the video, is the audio mix. A perfect 5.1 Dolby Digital soundtrack is provided, as is a new DTS mix. While not much of an improvement over the Dolby Digital mix, the DTS track is certainly louder. From the start of chapter 9 (Staros' attack) until Chapter 16 (the Bunker), the surrounds hardly quiet down, and the subwoofer is almost always active. Dialogue never sounds muffled or hard to understand. There is one instance, however, where the dialogue is a bit strained during scenes with John Travolta at the start of the film. Although it is noticeable, it is most likely dependent on the system. The DTS mix also shows off Hans Zimmer's score a bit better. Either way.... there is no way you can go wrong with this soundtrack. Extras Review: What a shame, what a shame indeed. Losing even the lone extra that graced the previous release, this latest version of The Thin Red Line is a disappointment when it comes to extras. While a commentary track by the reclusive Malick might have been a bit too much to ask for, a trailer or HBO First Look would have been nice. I can only hope a special edition looms in the future. I will be the first to admit that I am a bit biased when it come to The Thin Red Line. The films source material by James Jones is my favorite novel, and the film is beginning to gain the same distinction. Aside from the glaring lack of extras (even less than what was on the previous sparse release), this disc still comes highly recommended.